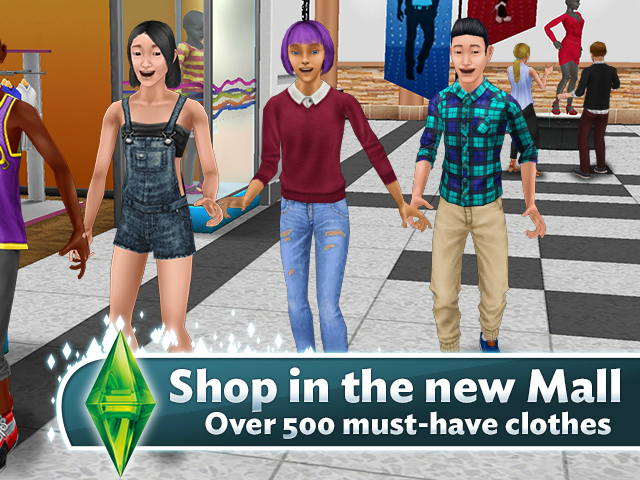 EA Mobile announced the latest content update for its mobile life-simulation game, The Sims FreePlay. This fashion-forward update introduces the community’s “most requested feature,” as users can now build the Sunset Mall, unlocking new quests and more than 500 new clothing and accessory items for customizing their Sims. The build location for the Sunset Mall is located next to the Famous Sim Town Sign, and it requires $325,000 to build. The construction timer lasts for the better part of three days, but once the mall is finished, players have access to new quests, as well as 16 new shops, a Burger Bar and a Bowling Alley. The mall’s stores contain outfits and individual clothing items (dresses, shoes, coats, etc.) for Sims of all ages, from toddlers to seniors. Along with these new clothing options, players can train their Sims in new Catwalk Modeling and 10 Pin Bowling hobbies. If players master every move in the Bowling hobby, they’ll unlock the Juice Bar for their town. As if that wasn’t enough, Lunar New Year content will be added to the game Feb. 14. This content will see Sims hanging up lanterns and cheering on lion dancers in new quests.